A sealant is a plastic resin applied to the chewing surfaces of the back teeth---premolars and molars. It bonds into the depressions and grooves of the chewing surfaces, hardens and acts as a barrier against plaque and decay. Boar, badger and horse hair were used for toothbrush bristles but were later found to be abrasive and harsh. Nylon bristles were introduced in 1938 by Dupont. Toothbrush bristles cannot always reach into the depressions and grooves to extract food and plaque. The job of sealants is to seal off these areas from plaque and food. Sealants hold up under the force of chewing and can last several years before a reapplication is needed. Keeping your children on regular dental checkups enables us to make sure the sealants are still doing their job….to fight against decay. Children and teenagers are the most obvious candidates for sealants, but adults can benefit from them as well. 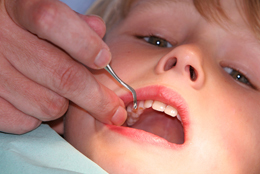 Sealants are a treatment that can re-enforce preventive dentistry.